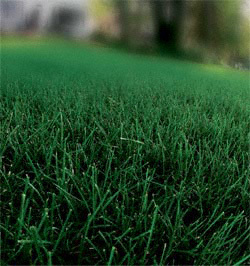 Picture prefect lawns: begin with good soils first! Having a good soil is the ideal foundation for a picture-perfect lawn and where everyone should begin in their quest for the ideal lawn. You can get a green looking lawn by dumping fertilizer on it, but unless the soil is healthy, the fertilizer is just a short term fix. Spending some time creating a healthy soil will go a long way in creating a healthy lawn that requires less fertilizer, and less watering. If you have a bare plot of soil, or are ready to re-establish a new lawn, then you are in an ideal place to get started. If you already have a lawn in place and don't want to start over, then the process is a little slower, but it is still doable. Every year you want to recycle organic matter into the lawn. This can be done in multiple ways. Don't bag lawn clippings. Lawn clippings provide a regular addition of organic matter into the soil— and it's free! Aerate the soil annually. Aerating brings cores of soil and thatch to the surface where they can add additional organic matter back into the soil through microbial activity. Add an annual top-dressing to the lawn. This is really a big jump start to improving your soil. 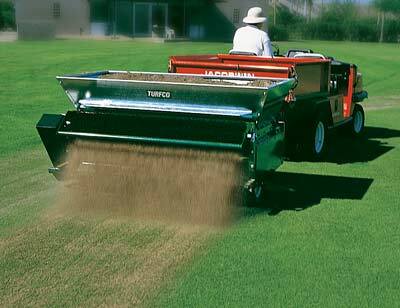 The thin layer of top-dressing adds a lot of natural organic matter into the top layer of soil. In time, this layer will develop into several inches of good friable loam that will provide ideal growing conditions for your lawn. The above photograph shows large commercial top dressing equipment making an application to a large field. Having a healthy soil means you'll have a thick healthy lawn requiring less fertilizer, fewer weeds, and less opportunities for disease and insect problems. Begin with the soil first and the rest will almost take care of itself.